The remedy is applied to induce bile movement and so helping the digestive process. It may be used in the treatment of jaundice and gallbladder problems such as inflammation and pain or congestion due to stones. It will relieve constipation, (particularly due to gallbladder or liver conditions), promote urination, stimulate the body and its metabolic rates, induce expectoration, and boost blood circulation. Due to its potency to regulate liver functionality, the herb may also enhance your skin healthiness which may be interrupted by liver abnormalities. Typically used for spleen and pancreas conditions, chronic weakness, pulmonary conditions with night sweats; dropsy following acute disease, in convalescence with severe intermittent fever, enlargement of the liver and chronic bronchitis. After the discovery early this century that wahoo has a digitalis-like effect on the heart, it also became popular as a cardiac drug. Also is useful for treating venereal diseases, uterine discharge, skin ailments and to induce vomiting. It is known as a remedy for dandruff and scalp problems. Ingredients: Wahoo Root Bark, Structured Water, 20% Alcohol. Non-Alcohol: Wahoo Root Bark, Structured Water, Vegetable Glycerin. Contraindications: Avoid prolonged use. The bark of Wahoo can cause various symptoms of poisoning if not used as directed, such as nausea, cold sweats, and prostration. 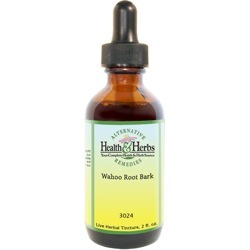 Using too much Wahoo bark or root bark may result in a severe purgative action.